I think that if I had to chose my absolute most favourite meal/food in the world, it would be pizza. (Shocking, I know)... But if I had to chose my second, it would be this salmon and asparagus!! I know it seems an unlikely second, given that the first is basically a ball of yeasty dough covered in cheese, and the latter may actually be one of the healthiest things you could eat...but hey, I like what I like! The absolute magic is the low temp roasting. All I did to the fish was simply coat lightly in olive oil, salt, pepper and some Epicure lemon dilly I had in my spice drawer. But really, just S&P is good - that's all the asparagus got. 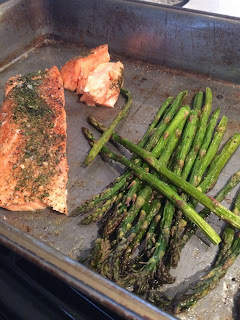 I throw both the asparagus and the salmon into the oven (convection) at the same time, but as soon as my salmon reaches 140 degrees (something you can only know by using a thermometer), I take it out and increase the temp of the oven to 400 degrees so that I can finish off my asparagus. This follows my requirements for the Go-To Dinners...they need to be: simple, healthy, delicious, fairly quick and easy to prepare (also free of dairy and gluten). So there you have it! Try it! Just make sure you're starting out with a really nice piece of fish. Add rice or some other side if you wish. Let me know if you try it and how it turns out for you.